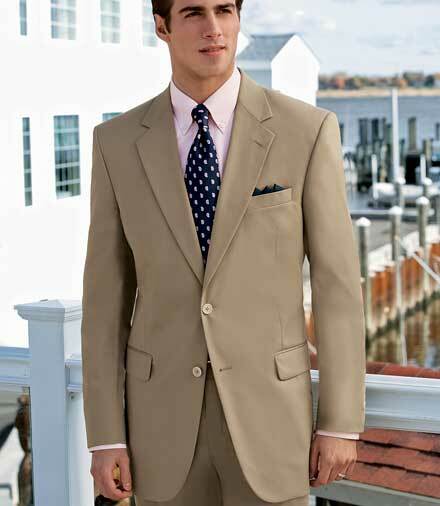 This year we will begin to see more and more khaki suits at weddings, especially during the spring and summer months! For brides and grooms who want to sport a more casual wedding affair, khaki is the way to go. Your wedding will not sacrifice one bit of class or style, only highlight your accent colors and create a distinguished look for your bridal party. I love how the khaki complements the white dresses without being overbearing. It keeps a clean chic look when the couple is together. 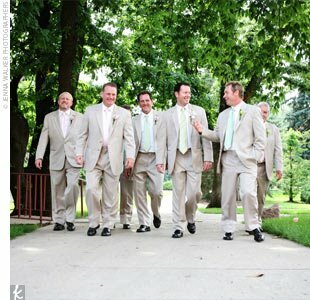 Khaki suits still go with any and every color that you would want for your wedding but add a softer, more casual touch to the style! It is a very clean look that will impress your guests! I want to hear your opinions on Khaki Suits? Would you let your groomsmen sport these? I personally will not be using khaki suits. My wedding is more formal, big church, big reception. And it’s a fall wedding with darker teals and greens, so it really wouldn’t fit. I do love them for summer weddings, especially outside!! Just totally depends on the theme, location, and time of year! These scream back yard wedding, in a really great way!